Continuing on with the letters my dad wrote home during his induction and basic training. 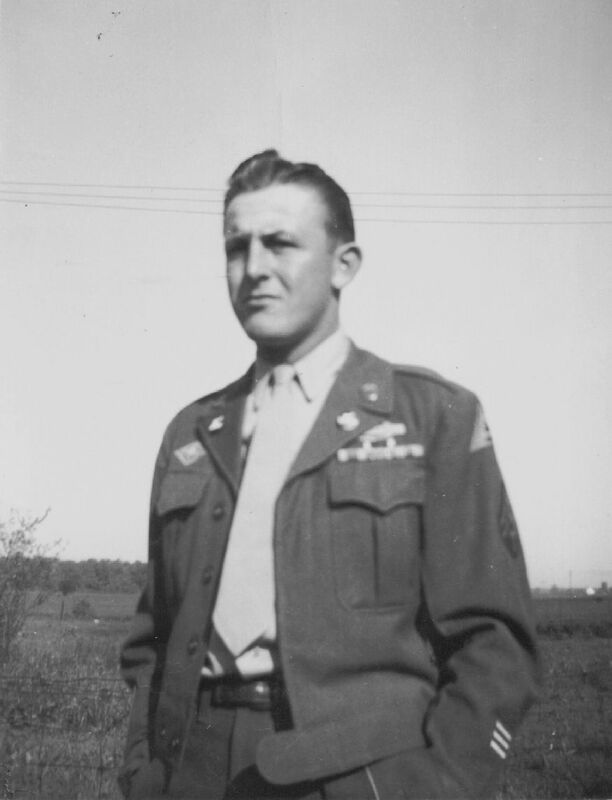 My dad, Herbert Miller, was 18 years old in 1944 when he volunteered for the draft. He had graduated from Willshire High School the year before. He spent 2 days at Fort Hayes, Columbus, Ohio, for his pre-induction physical in May 1944. He arrived at the Reception Center at Fort Benjamin Harrison in Indianapolis, Indiana, on or about 29 June 1944, where he was inducted into the U.S. Army. He left for basic training at Fort McClennan, Alabama, on 8 July 1944. Below are two more letters that he sent home while he was at Fort Benjamin Harrison, Indianapolis. It is Friday morning here and not much to do if you know how to work it. I’ve had K.P. for one night and two special details so far, the rest of the time I’ve been doing nothing to speak of. Yesterday they shipped out around 800 men. They went on a troop transport. They don’t tell you until the morning when you leave and you don’t know where you are going until you arrive at the station. As I was saying this bunch that left. The train had a wreck around Chattanooga, Tennessee, close to the Kentucky border. Two cars or coaches were upset in the river and two coaches upset and caught fire. There about 20-30 Mercer Co. boys on it. We haven’t heard anymore about it except around 200 were injured and 7 or 8 killed. The ones from Mercer Co. that went that I know were Bob Andress, Floyd Brehm, Joe Solerno [? ], Edson Smalley, and Luther Case. And some more I can’t think. I got a letter from Johnnie & Clara awhile back, a card from Howards. The only reason I’m not going to write to them now is because I might be shipped out anytime. Will write to Bernice and all of them when I get stationed. Friday-G.I. Day- the day when you get on your hands and knees and scrub out the barracks floors and latrine. I got Helen’s letter yesterday and am sure glad that she is getting along ok with my car. Gee wizz. A Grade 1 tire! How is the Gasoline holding up? If I’m still here Saturday I’m eligible for a pass to town maybe a 12 hr, maybe a 24 hr. I’m writing this from the Recreation Hall here from camp. It’s crowded with G.I.s. They have a G.I. band playing now. P.S. You say Helen hasn’t heard from Red yet. Sure hope none of the Mercer Co. boys were hurt. Just a line, can’t write very much. We are shipping out today. Floyd Brehm, Bob Andress, and some guys left day before yesterday. About all of the rest of the Mercer Co. guys ship out today except Hoblet. It’s about 6:15 Sat. morning and we don’t know where we are going. I’ll write as soon as I get to the next camp. The train wreck my dad referred to in the first letter was one of the most deadly, if not the most deadly non-combat U.S. military accident. The Louisville & Nashville passenger train was heading south, transporting 1,006 new recruits to their first Army unit assignment at Fort Benning, Georgia. The speeding train could not make a sharp curve over the deep Clearfork River gorge near the town of Jellico, in Campbell County, Tennessee, on the Kentucky-Tennessee line. The engine and several cars plunged down the 50+ foot gorge where 44 soldiers were killed and several hundred injured. At least one Mercer County native was on-board, Clarence L. Eckstein of Celina. He was not injured and went on to serve in Europe during WWII. You can read about this disaster on-line: WWII Troop Train Wreck of July 6, 1944. Scary to think my dad could have been on that passenger train that night. I will continue with my dad’s letters from Fort McClennan, Alabama, next week.